Our cool, creamy, crowd-pleasing cheesecake features a hint of lemon and PHILADELPHIA Cream Cheese. The best part? 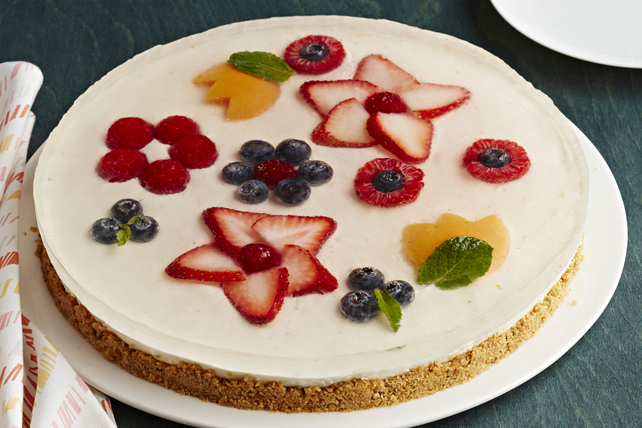 This cheesecake is a showstopping no-bake! Sprinkle gelatine over 1/2 cup lemon-lime beverage in small bowl. Bring remaining lemon-lime beverage to boil. Add to gelatine along with 2 Tbsp. sugar; stir 3 min. until gelatine is completely dissolved. Pour into 9-inch square pan. Refrigerate 45 min. or until slightly thickened, stirring occasionally. Combine graham crumbs, butter and 2 Tbsp. of the remaining sugar; press onto bottom of 9-inch springform pan. Refrigerate until ready to use. Beat cream cheese, lemon zest and remaining sugar in medium bowl with mixer until blended. Gently stir in Cool Whip; spread over crust. Refrigerate 3 hours or until firm. Run knife around rim of pan to loosen tart. Remove rim of pan before serving. Do not use fresh pineapple, papaya or kiwi fruit to garnish the tart. Gelatine will not set. Add 1 tsp. lemon zest to cream cheese mixture before spreading over crust and decorating as directed.